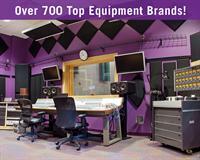 Full Compass is a national leader in Professional Audio, Video, Lighting and Musical Instrument sales. Since 1977, our goal has been to provide the best possible value with exceptional customer service. In addition to offering over 700 equipment brands, we also provide services such as computer systems integration and equipment rentals (rentals available in WI only). Full Compass is an authorized service center and parts distributor for most of the major manufacturers we carry. Call 800-356-5844 or visit fullcompass.com. Two miles West of the Beltline on W Mineral Point Road. Left at South Point Road and first right at Silicon Prairie Parkway.